Ukulele Advice: Do I need a strap? How do I hold this thing? This is a guest post by Ted Parrish, co-author of our newest release, Ukulele for the Complete Ignoramus, available on nativeground.com & Amazon (also in Kindle format). 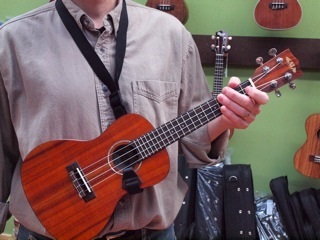 A lot of ukulele beginners struggle with holding the instrument and ask what to do. It is important to have the instrument supported so that you don’t have to worry about holding it up and can instead concentrate on playing. The good news is there are many options for supporting your uke. 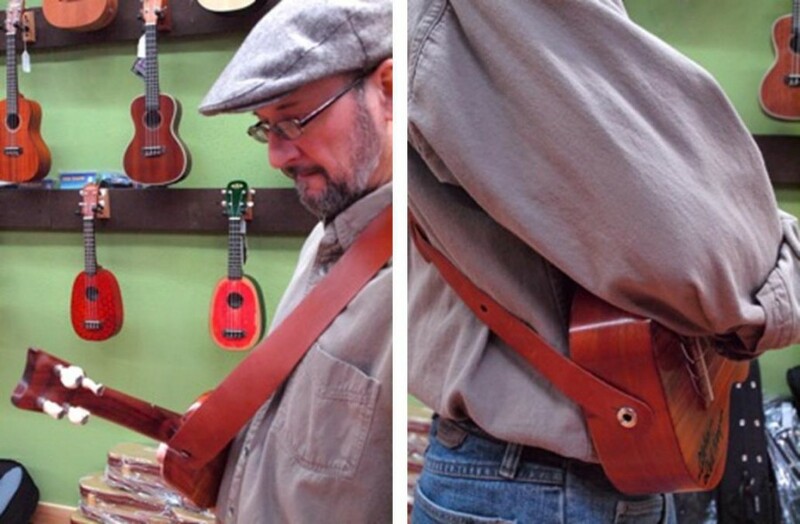 Traditionally a strap is not used with the ukulele. 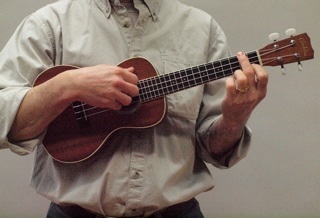 The classic way to hold the uke is to keep the neck more or less parallel with the floor, then push the end of the uke into your right bicep. Then you apply a little bit of a squeeze with your forearm, pinning the uke to your body. This gives enough support so that your left hand does not have to hold and fret at the same time. This works best with a soprano uke. Once you get into a larger size it gets harder to pin the uke down. A heavier uke (like a banjo or electric uke) can also present a challenge. Some folks are just not comfortable holding the ukulele in this way. This is when you should explore strap options. Installing strap buttons, if done properly, won’t damage your instrument. And the little bit of extra weight is a fair trade off for a secure strap around your neck. There is another style of strap – the classical guitar strap. This one requires no strap buttons. The strap goes underneath the waist of the uke, comes up underneath, then hooks on to the sound hole. It is very supportive as well, but if you let go of the neck the uke will tumble to the ground! With any strap I suggest you always keep a hand on the uke to prevent a mishap. Keep on rockin’ that uke!